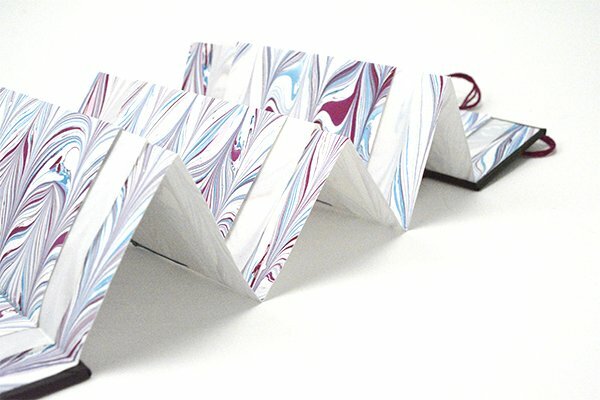 This past week I’ve been playing with accordion book structures and in particular those from Alisa Golden’s Making Handmade Books:100+ Bindings, Structures & Forms. This book is a really comprehensive guide to many different book structures and I’d highly recommend it if you’ve dabbled in bookmaking before and want to expand your knowledge. 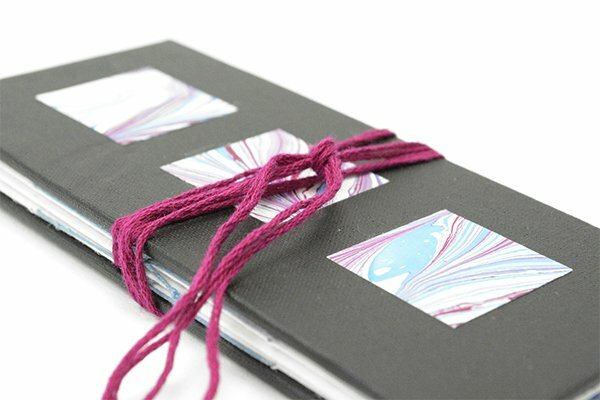 It’s particularly good if you’re interested in creating artists’ books. 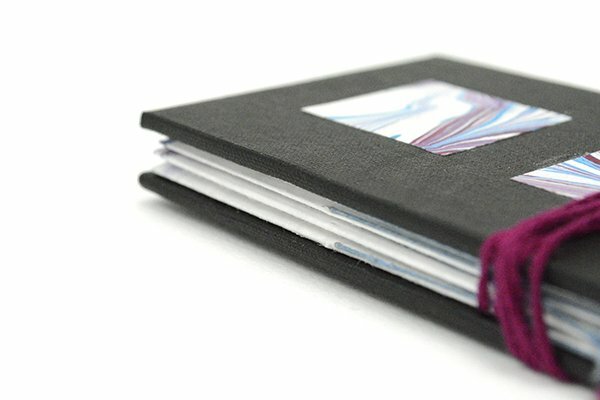 An accordion book is a good beginning book structure because it teaches students the importance of paper grain and it requires accuracy when measuring, cutting and folding paper. But it’s also a really versatile structure that can be re-invented in dozens of different ways and I come back to it again and again. 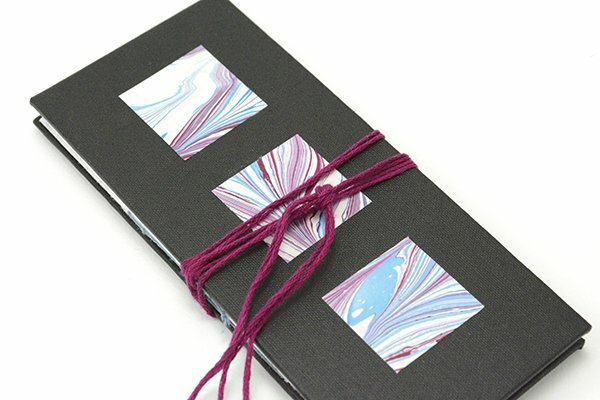 This is book number 29 in my 50 Book Project – a triple accordion book with a hard cover wrapped in black book cloth. 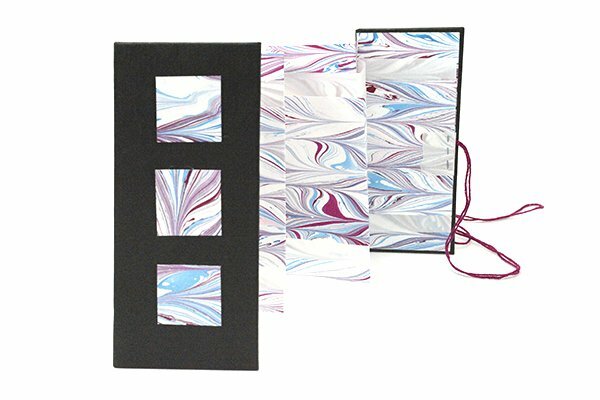 The outer and inner accordion layers are marbled paper and the middle layer is vellum. The three accordion layers are sewn together in the valley folds with waxed linen thread, which you can see in photo below. 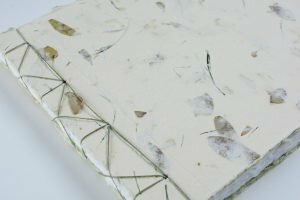 I used a piece of embroidery floss to tie the book together and decorated the cover with three 1″ squares of the left over marbled paper. This is really beautiful. I’ve not worked with the accordion format as I struggle with how to “use” it and not sure I actually like it. I have this quirk about wanting to know in advance the advantages of something over what I am used to working with, even though I have past experience with the aha moment coming in the midst of making. Seeing this version is helping me get at least a partial grip on why I might want to make an accordion fold book. This is definately on my to do list, I’ve yet to try making marbeled paper but I have a lot of paper art curtesy of my youngest son when he experimented with Brusho pigments. The front cover reminds me of the Father’s Day card he made.